The demise of Toys R Us in mid-2018 presented a major opportunity for other retailers to capture a portion of the defunct chain’s $11.5 billion in annual toy sales. For toy brands, it also meant that other large national retailers, including Amazon and Walmart, would become even more important sales channels in order to recoup lost Toys R Us revenue. Toy consumers have quickly shifted a lot of their spending to these already well-known retailers. According to Retail Dive, Amazon reported a 30% year-over-year increase in toy sales during the latter portion of 2018, and Walmart has similarly seen its toy sales help drive overall revenue increases. Across both Amazon and Walmart.com, the average number of images present on top-selling product pages goes up steadily alongside price - topping out over 7 for products costing $100 or more. 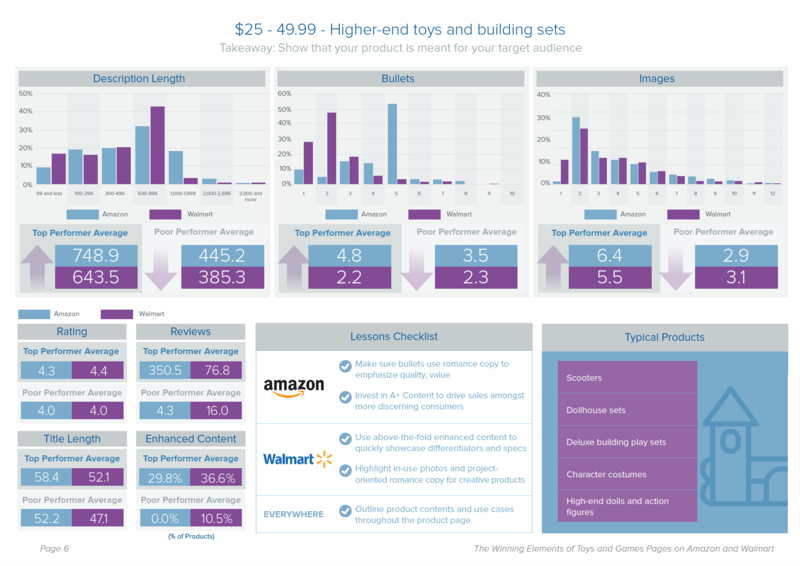 This emphasizes that consumers who are open to spending more when shopping for toys and games products are looking for the kind of robust imagery that emphasizes that the product is high quality and gives them reasons to click 'buy'. Top-performing products across price points have between 4.9 and 6.2 images, on average, while poor performing brands have less than 3. Additionally, many top-selling products include one or more photos with in-image text around unique features, giving consumers easily discernible reasons to buy their brand without needing to scroll down the page. Across price points, top performers use A+ Content much more frequently than poor performing products. Consider outlining unique product benefits below the fold and highlighting positive attributes or your related product line, with photos. Ultimately, your Amazon product detail page is the chance to represent the full story of every item you sell. Buyers want to understand the purpose, benefits, and why they should buy from your brand, at a glance. By understanding the tactics used by top-performing pages at every price point, you can adjust your own strategy and stand out across the digital shelf.